A rescue operation for the polar research station 'North Pole-35' is to be completed within two days – in spite of adverse weather conditions. 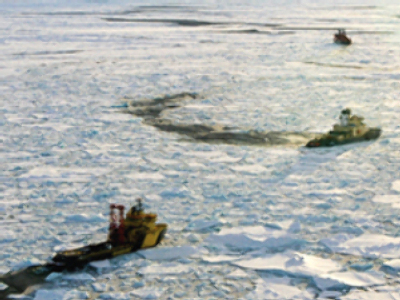 An atomic ice-breaker cleared a path to the drifting ice station for the 'Mikhail Somov' research vessel on Sunday and the crew has begun the evacuation of explorers. The expedition started in September 2007 – northeast of the Severnaya Zemlya Archipelago in the northern area of the Taimyr ice field. It monitored weather and oceanography as well as ice and pollution levels. The load of over 220 tonnes is to be carried by the 'Mikhail Somov'. 20 polar scientists together with two Eskimo dogs are to be the last to leave the station.